After long time i am back again for commits 🙂 So yesterday i pushed some code to open Grayscale PSD in Krita. some people here might think that why to go through manual building process, why not the easy ways? Idea is to learn and fix some of the things yourself. I compile only base phonon package and phonon-xineand rest are optional as i tried. I have been lazy writing a blog as i didnt had much to say 🙂 but here is my introduction and some briefings about my project. 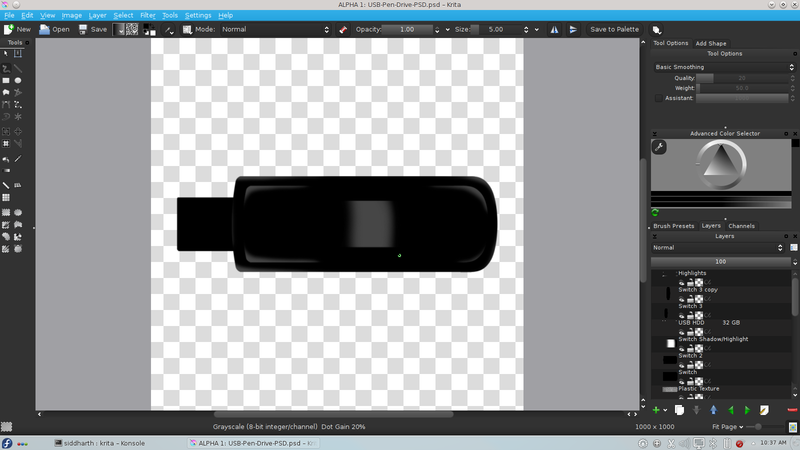 I am Siddharth Sharma from India (irc:siddvicious/h4xordood) i did last summer plasma dashboard for skrooge and now its one more too much interesting project “Psd (Photoshop Document) import / export support in Krita”. I was at at kde conf in Banglore (March 2011) as speaker where i met interesting people, cool kde hackers. It was my first conference and was so much exciting to meet KDE Folks. I got started with Calligra as i met Inge Wallin and Boudewijn Rempt in Bangalore. I started of with minor bug fixing. so i am discussing everything related to my project with my mentor Boudewijn Rempt for this gsoc 2011. Psd import and export is very interesting project for me to do as i would be learning many new things and would be diving into code more deeper. My mentor has been helping me with understanding Krita code and explaing code which would be helpful for me during the project. Soon i will have something interesting to show as our coding period starts just 2 days left.